Amazon.com, Inc. (NASDAQ:AMZN) kept this summer Friday from being a boring one, announcing it will acquire organics grocer Whole Foods Market, Inc. (NASDAQ:WFM) for $13.7 billion in cash. The transaction values WFM stock at $42 per share, or a roughly 27% premium from Thursday’s closing price. Amazon says it will keep CEO John Mackey in charge of Whole Foods, will keep the headquarters in Austin, Texas, and will not rename the brand. “This partnership presents an opportunity to maximize value for Whole Foods Market’s shareholders, while at the same time extending our mission and bringing the highest quality, experience, convenience and innovation to our customers,” Mackey said in a release. The acquisition, while exciting, wasn’t necessarily a surprise. Back in April, it was reported that AMZN had interest in snapping up Whole Foods in fall 2016. The report came on the heels that activist investor Jana Partners had taken a stake and was attempting to get the organic grocer to consider a sale. While WFM stock has actually managed an 8% gain this year — about on par with the market — shares still were roughly half their value from 2013 peaks. That comes amid increasing competition in the organics space — not just from specialists such as Sprouts Farmers Market Inc (NASDAQ:SFM), but traditional grocers such as Kroger Co (NYSE:KR) and even big-box retailers such as Wal-Mart Foods Inc (NYSE:WMT). Kroger actually knocked Whole Foods back a couple of percent on Thursday in the wake of a mixed first quarter and awful full-year guidance indicating that food inflation is still problematic. Shares of WFM stock have temporarily been halted. Meanwhile, there’s little reaction in AMZN stock — a 1% bump higher against what looks like a slightly down day for the broader markets. The expected big brick-and-mortar retail splash from Amazon this year was its Amazon Go store — a no-line, no-checkout theme with little human interaction, where technology would help speed orders of foods and other goods. However, analysts believed Amazon could make headway in the grocery space — just not like this. Nomura Instinet analyst Anthony DiClemente wrote just yesterday that he was upping his price target from $975 per share to $1,100 (13% upside) on enthusiasm for the untapped potential of grocery. “In our view, Amazon is likely to grow sales marginally faster than Walmart … and substantially faster than Costco,” he wrote in Thursday’s note. But Amazon was expected to do that eventually via Amazon Go, and more immediately via its Amazon Fresh grocery delivery service — not necessarily through an acquisition of an established grocery brand. WMT shares, which also got hit yesterday after Kroger’s announcement, is sinking by more than 6% on Friday now that Amazon has turned the tables. For years, Walmart has been introducing additional features and adding e-commerce brands such as Jet.com to bolster its online offerings to better compete with Amazon. 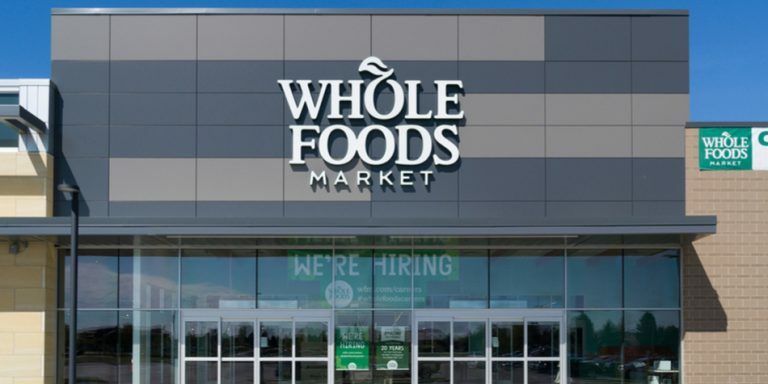 While Amazon Go was seen as a potential, certainly unknown threat, the buyout of WFM is a massive, immediate leap into brick-and-mortar that only sets Amazon up to extend its grocery offerings. In a whimper of a reply, Walmart also announced its own acquisition today — the official buyout of menswear company Bonobos, for $310 million. Article printed from InvestorPlace Media, https://investorplace.com/2017/06/amazon-com-inc-amzn-stock-surges-on-whole-foods-market-inc-wfm-buyout/.